Hunting PERMITTED in the fall. Check the ODNR website for specific weekends as they vary year to year. You'll get a nice variety of terrain on this ride. There are fast flowy sections and some challenging technical sections. 3 trailheads are available. However, only one offers amenities. This ride combines converted hiking trail with technical sections and modern IMBA standard fast and flowy sections. Starting at the Wards Rd TH going CCW, the trail undulates along the edge of the lake giving good views to the west. Eventually the trail turns inland along a finger and at about 2.2 miles the intersection to connect with the Harveysburg loop appears. Either continue straight to finish the Ward Rd loop or turn right, cross Trace Run Creek and continue on to the Harveysburg (Hburg) loop. Harveysburg Loop starts with a super steep eroded climb up from the creek shore. At the top you can go right or straight. Right will wind you through a thick honeysuckle infested section, although plans are to remediate in the near future (3/2014), then back out on to a peninsula toward the lakeshore for more views to the west. The trail again turns inland and after a couple challenging climbs you'll come to an intersection at the top of a hill. Go straight (left) to continue on Hburg. You'll quickly arrive at another 4 way intersection. Go straight again. If you turn right at either one of these intersections it will take you to the Hburg TH. Continuing straight Hburg levels a little before you get to the 3 sisters, a group of three successive creek crossings within about 1/2 mile of each other. Each crossing presents it own unique challenges. After the third crossing it's more or less down through a wash and back to the connector at Trace Run Creek. Continuing on Ward Loop, the trail winds along Trace Run Creek to a small crossing then the trail starts up again. The climb is challenging and ends up popping out onto Wards Rd. Beware of traffic at this juncture. Turn left and ride about 1/2 mile where the trail dives back into the woods to the right at a privately owned driveway. There is a trail marker at this location. The trail goes down another fast wash and into the woods. You'll cross another creek. climb again, then go back down the intersection of Wards and the Turkey Run trail. Go left up a steep climb with the ravine on your LEFT and return to the Wards Rd TH or go across the creek up a small climb and cross Turkey Run Creek. Turkey Run is the newest section of Caesar Creek. This section has a lot of climbing a good view of Turkey Run Creek near the top of the first climb. After the view, the trail rolls up and down until you arrive at the Turkey Run Connector. Turn right here and climb again riding slightly northward. The trail will cross a gas line easement and provides a good view of the lake to the left. Re enter the woods and climb the longest climb of the system. Continue until the next intersection at the bottom of a steep descent. This is the Campground Loop. Go right and enjoy another short, steep rooty climb. The trail continues through some old growth forest, around a frog pond and arrives at a small bench. Turn right, and continue about another mile to the Campground TH. Go straight to the campground check in for water and supplies. Or, turn right and go down the asphalt road for about 3/4 mile. The trail re enters the woods on the left. Another 1/4 mile of riding will return you to the Turkey Run connector. Turn right and climb back up retracing the trail to the intersection of the connector and Turkey Run. This time go straight (right) and you'll quickly return to the intersection of Turkey Run and Wards. Cross the Turkey Run Creek again and veer right at the intersections. Cross another small creek and climb the steep hill with the ravine to you left as described above. Return to Wards TH. 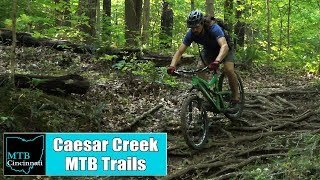 This is one of the original mountain bike trails in the state. Riders were first allowed on these trails in the early 1990's.